Musings that are on balance - Kosher. I've kind of stopped blogging, but every so often someone does something annoying enough, that you kind of want to share your anger with everyone. This week's culprit is Rav Aviner. Rav Aviner, is not my cup of tea. To be honest, he's not even my choice for a second rate biscuit to dip in my tea. However, he has over the years, never quite managed to cross my line for "bad" rabbis, and just stayed in my "not cup of tea" rabbis. Well he's now in my "bad" rabbi list. This weekend I picked up "Olam Katan" for the first time in weeks. 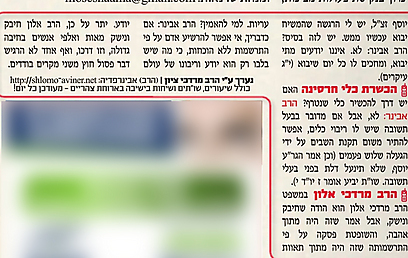 I used to read it every week (yes, during davening) but I've been fed up with them after the whole incessant anti Rav Stav campaign that they launched, succeeded, and then failed to apologise to the Dati-Leumi public for. So what did we see this week? "In the trial Rabbi Morechai Alon confessed that he hugged and kisseed, but said it was out of love (!-Bot), The Judge ruled based on her impression that it was out of lust. Who should we believe?" If it is as you say, you can not convict a person based on impressions and not proof, because what is in his heart is known only to himself and to god. More so, Harav Alon hugged and kissed hundreds, and thousands, of people with great warmth, and that was his way, and no one felt that it was wrong, except in a few single instances. COME ON. lets ignore the fact that it wasn't only the judge who thought Rav Alon was a little "lusty", it was a whole room of top tier rabbis. But really, even if it was only the Judge, how can you possibly dismiss the court as "having no proof"? Are witnesses no longer considered proof? does halacha not use witnesses? and seriously...so it was only a few instances...so it wasn't wrong? lets just blame the victims who misunderstood everything..
Rav Aviner and his best pal Rav Druckman (who also supports Alon) have seriously failed their public. Please now leave us alone.